Booking a private jet rental alone can be time consuming, expensive and not to mention a hassle. Furthermore, if you do not know much about the industry it can be difficult to know whether you are receiving a decent rate, good service and adequate safety. Utilizing a broker can solve all the issues relating to private jet rental and provide you with benefits you probably have not even considered. The main aspect of your broker’s job is to understand your needs and act in the same way as a travel agent would in order to find the private jet operator that is best suited for you and at the best rate. This service may include a personalized itinerary both in the air and on the ground such as meal options on board, transportation to and from your destinations, and even hotel rooms should you require them. Brokers utilize partnerships in order to receive quotes from various operators on multiple aircrafts. Without the help of a broker, the private jet rental process would be excruciatingly time consuming. Through their links to various charter companies with multiple fleets of jets, brokers can quickly find the best service to suit your schedule and even find you a jet in your preferred model. Brokers’ relationships with carriers in both national and international locations help you to receive the optimal private jet rental service to any destination at the lowest cost. Sometimes it can be highly beneficial to have access to information not known outside of the air travel industry. For example, brokers can know how weather conditions will affect flights and whether any last minute schedule changes will require a different aircraft or airport. Combined with their connections to major operators, brokers can efficiently assist in the replacement of aircraft if the original craft experiences any mechanical problems and can help you keep to your schedule even if you need to make last minute changes. Brokers can satisfy almost any request in regards to your private jet rental at short notice. When booking a private jet rental with a broker, you are ensured better security and safety than if you make your reservation independently. Your brokers knowledge of FAA regulations and restrictions referring to factors including flight duty and rest requirements gives you the assurance that your charter operators are complying with protocol. Your broker will also review charter operators’ certifications and safety records and can provide you with the safety information relating to your individual pilot and aircraft. 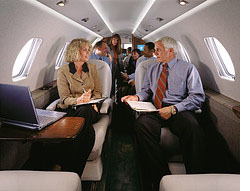 If required, your broker can take care of your insurance needs to further simplify your private jet rental experience.